On Tenrife, about 2km north-east of Montana de Guajara. Saddle: Between Montana Pasajiron and Roque de la Grieta. Saddle location: north 28:13.403, west 016:35.409 (GPS in the saddle). Route description: After descending the east ridge route from Montana Guajara to the saddle, instead of returning to the road below, head straight on to the lowest part of the saddle. A trail, still marked with cairns and painted dots, heads up towards the summit of Montana Pasajiron. This mountain is quite flat near its top, the trail passes just east of the highest point. This ascent is an easy (YDS) class 1 trail. Continue the rim traverse: Climb on to Roque de la Grieta. Comments: The climb from the saddle to the top of this peak took about 20 minutes. There is an unusual difference between the map and my GPS concerning the elevation of this peak as well as the elevation of its saddle to Roque de la Grieta. My GPS (accurate to 10 meter) gave an elevation of 2540 meter for Montana Pasajiron and 2440 for the saddle, compared to 2529 meter and 2413 meter respectively, on the map. 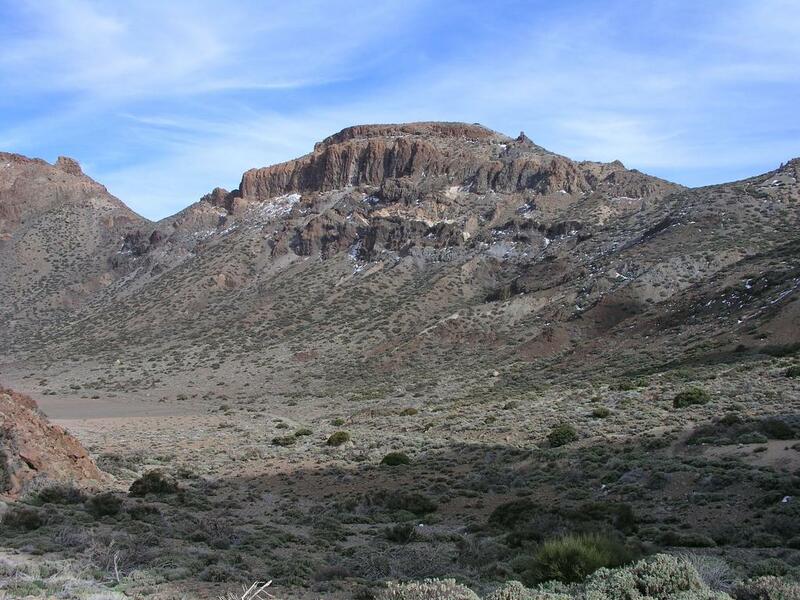 The elevations of the saddle towards Montana de la Guajara and the elevation of Roque de la Grieta, that is both before and after the two measurements above, were in agreement with the map.